Our thanks to Ken Hollywood. The library information manager for NERC, the Natural Environmental Research Centre. Ken formerly worked for a management consultancy and for IBM. The SLA Winter Warmer Quiz, held on Thursday February 1st, saw a full capacity audience of fellow SLAers battling to be crowned top quiz team and win a £20 book token each. Andrew Grave of the Events Committee informed me of a few changes that had occurred this year both “on and off the pitch”. Long-term sponsors Acquire Media handed over the baton to InfoTrack and the venue for the evening moved from the City of London into the heart of London’s West End at O’Neill’s in Wardour Street. 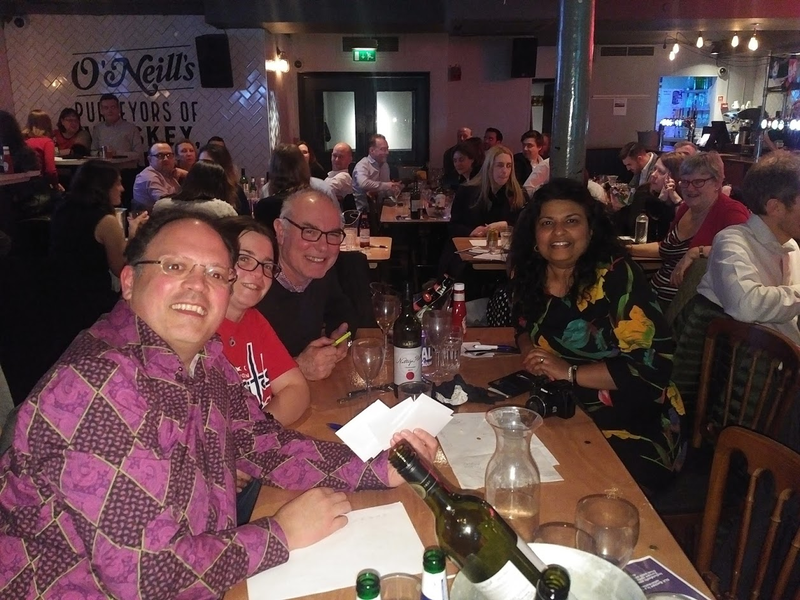 Team wise, last year’s winners, At Least We are not Last, captained by Sarah Bicknell, split into two; the RSM Originals and At Least We are not Last. Dewey and the Decimals, captained by Helen Lippell, winners in 2015 but absent in 2017 made a re-appearance. The scene was set for an interesting evening! Katharine Schopflin, 2018’s SLA Europe president, welcomed everyone to the event before handing over to renowned quizmaster Steve Roy of AskTony. Questions quickly got under way with a demanding set of “In the News” questions. Most memorable amongst these was one asking what does President Trump leave out of his Big Macs? The answer is at the end of this review. Unprecedentedly, one team managed to score zero in the round. Further demanding series of questions followed, washed down with food and drink. 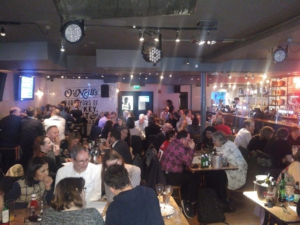 This was my third SLA Europe Winter Warmer Quiz and it gets better every year. The questions concluded with a strictly timed three-minute question on those Shakespeare plays that don’t mention a person, place or animal in their title. I think my team managed to find about five fitting the criteria and I’ve never known three minutes to pass so quickly! Was I the only person to Google that question the next day? Then it was time for the scores to be unveiled. As the scoreboard shows, no more than two points were separating each team in the top 12 from the team above it! The wooden spoon or should I say spoons went to three teams, who remain anonymous. Each team got a bottle of red. Tomato sauce, that is! In third place were a team known as BLECC and familiar to the rest of us as InfoTrack. They had a great debut with 119 points. InfoTrack generously donated their prize of Matchmakers to fourth-placed team the Misfits. 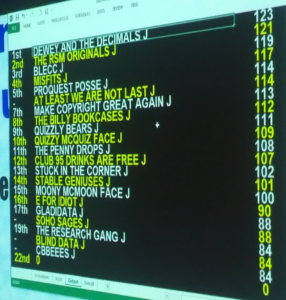 Two points above BLECC in second place were the RSM Originals with the winners Dewey and the Decimals taking top spot. I’m happy to report my team came somewhere in the middle. Thanks again to sponsors InfoTrack, the SLA Europe Events Committee , AskTony, and to all at O’Neill’s for hosting such a large but very friendly group. AskTony’s Steve Roy certainly proved his patience and professionalism as always in leading the quiz. The Winter Quiz ranks with the SLA Summer event-as a great opportunity for networking and socialising and I’m looking forward to next year’s already! And what is unusual about Donald Trump’s Big Macs? He doesn’t have the bread.